Google (GOOG) is imminently close to giving its competitors another blow by launching its own Web browser called “Chrome”. The browser will be available to everyone as early as Tuesday (Sep.2) reports AllThingsD – and will be open source, meaning others can modify the code. Philipp Lenssen at Google Blogoscoped, a blog that follows the company, reported Monday that Google had sent him a comic book where Google explains the technical specifications of its open-source browser. According to the book Google implies Chrome, which will be WebKit-based (an open source app framework upon which to build a web browser), is much faster than Internet Explorer and Firefox. – Chrome runs each tab in a separate process, so a crash will only bring down the one tab, and not the entire browser. In addition, instead of traditional tabs like those seen in Firefox, Chrome Tabs will go on the upper side of the window, not below the address bar. – Location bar will support auto-complete functions called “omnibox” which will offer search suggestions of different web pages you’ve previously visited as well as suggesting sites you haven’t. – As a default homepage Chrome introduces an Opera-like speed dial feature. On that page you will see your most visited webpages as 9 screenshot thumbnails. – To fight malware and phishing attempts the browser will keep downloading up to date information about web sites with malicious code. Google also reiterates that whatever runs in a tab is sandboxed so that it won’t affect your machine and can be safely closed. – Google’s Chrome application makes heavy use multi-threaded programming, which could speed it up a lot on computers with newer multi-core CPUs. 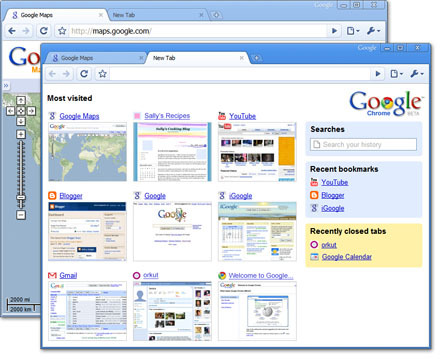 Th browser is also expected to integrate various Google services in it. While a Google browser has been rumored for several years now, it remained just that: a rumor. Apparently, Google has now put those rumors to rest by offering more competition in the browser area and developing services directly aimed at challenging Microsoft (MSFT). Google’s browser could also create problems for Mozilla organization that builds Firefox, a free browser that has become increasingly popular lately. The Mountain View, California-based co. last week extended its support of the Mozilla foundation until 2011. Their agreement, was set to expire in November of this year. Has anyone actually used this yet? ?